Historically most varieties originate from China and Japan including the doubles called Yae zakura. Special parties and holiday trips are arranged to visit flowering cherries in Japan where they are revered as inspiration for artists and warriors as a symbol of purity. Double flowered varieties give the best effect when planted as solitary specimens or groups of 3 of the same variety. Do not mix varieties that flower at the same time as they detract from one another. An isolated specimen planted by a pool can be quite stunning when reflected in the water. The wild species Prunus avium looks best in large groups perhaps on a hill side. 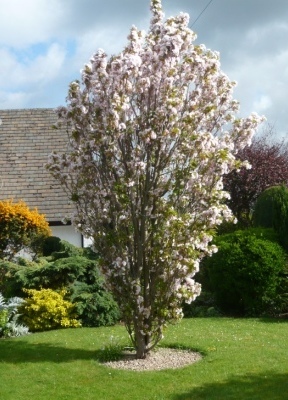 Single varieties are the best for avenue planting like Prunus Washi-no-o (with a name like that why not hunt it down). Plant 20-30 feet apart depending on the vigour of the variety. Different species have different habits and the ultimate shape of a Cherry tree is in the DNA. For a small space a narrow upright fastigiated (clusters of erect branches often appearing to form a single column) tree resembling a short Poplar may be useful. Prunus Yedoensis erecta for example. Tulip or wine glass shaped are broader but still useful in smaller gardens Prunus Hillieri Spire. This sort can add height to a garden design without requiring too much ground space. The circle around the tree helps water to penetrate, avoids competition from grass and looks aesthetically pleasing. Upright spreading varieties such as Tai Haku are the most familiar. Prunus Spontanea and Okame are recommended varieties. Weeping or pendulous trees are the opposite of fastigiate and are useful near ponds and are generally lower growing like Prunus Kiku-Shidare. There are several other standard habits including Conical or Cone maintained in shape by pruning. For smaller gardens the Bushy topped varieties like Prunus Morello and the Autumnalis may suit. Another variety of note is Prunus Shirotae with a flat topped appearance when mature that is useful when a distant view is not to be obscured. 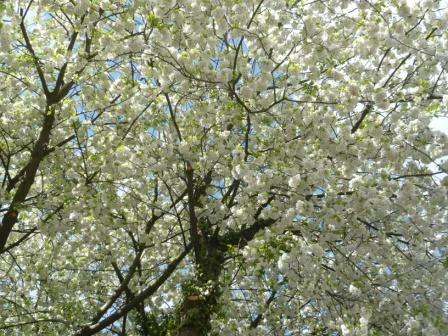 In Japan the flowering cherry has been revered for centuries. In 1594 cherry-flower viewing parties were held by the Japanese Emperor and holiday tour operators do similar trips today. Prunus is the family name for cherries and P. Serrulata the ‘mountain cherry ‘ is the Japanese favourite. Its pure white blossom is a symbol of chivalry, purity and honour. Single and double varieties vie for our attention and shapes and sizes vary by variety so some guidance is given below.I prefer the single white but the double pink varieties. I am grateful for some comments on shape, form and examples by Geoffrey Chadbund in his book ‘Flowering Cherries’ ISBN 00211271X. 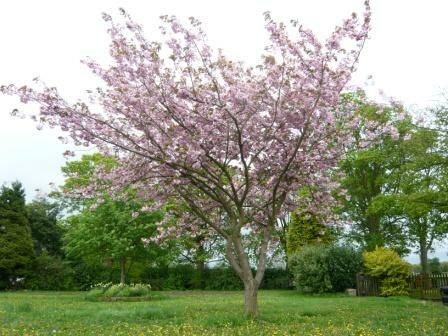 Tips on Selecting Flowering Cherry trees. With so many varieties to chose from here are a few tips that may be of assistance in choosing your variety from a list of over 200. Some trees have attractive bark with rings (lenticles), shine and colour. Select one of these for winter interest. Fit the shape of tree to the surroundings. Consider if it will block a view as it grows or how it will look in say 10-20 years. Some grow quite robustly. Consider Autumn colouring which can be quite a feature and cherries although many bred varieties are sterile. Seek out a grafted ‘Standard tree’ if you want a small tree. Hillier or Nocutts nurseries usually have a good selection or use the RHS plant finder. There are two native species: the wild cherry P.Avium and the bird cherry P.Padus.